The Nigerian Maritime Administration and Safety Agency (NIMASA) has partnered with the Nigerian Heart Foundation (NHF) to assist the Non-Governmental Organization (NGO) in creating awareness on the dangers of heart diseases and the effect on the well-being of people. 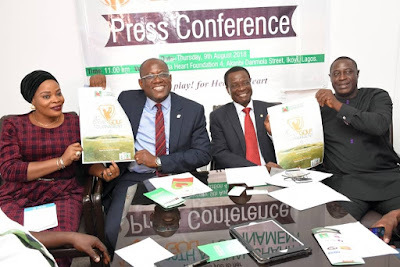 Director General of the Agency, Dr. Dakuku Peterside, disclosed this on Thursday at a Press Conference held in Lagos in preparation for the NHF Charity Golf tournament scheduled to hold on September 1, 2018, in Port-Harcourt, Rivers State. The DG who was represented at the event by the Head, Corporate Communications of the Agency, Mr. Isichei Osamgbi, charged Nigerians to ensure that they take on physical exercises as a means to prevent the risk of heart related diseases, stating that heart health is important to the overall well-being of the human body. “Heart related diseases affect all gender and all ages and cut across all socio economic and geographic lines,”Dr. Peterside said. The CEO NIMASA stated further that the Agency was partnering with NHF as part of its corporate social responsibility (CSR) focus and was delighted to be working with the foundation in its drive towards raising awareness on heart related diseases. Also speaking at the press conference, the Executive Director, NHF, Dr. Kingsley Akinroye, noted that in its bid to reduce and prevent cardiovascular related diseases in our population, plans were underway to raise the sum of N100m from the charity tournament, to help raise the awareness. NIMASA is Nigeria’s maritime regulatory agency, working hard on its mandate to achieve and sustain safe, secure shipping, cleaner oceans and enhanced maritime capacity in line with global best practices towards Nigeria’s economic development.